Identification: Forewings are stubby. Upperside is golden-orange with blurry dark markings; stigma of male forewing has black felt inside it; forewing of female has a white transparent spot below the end of the cell. Underside of the hindwing is yellow-orange in the male, brown-gray in the female; both with or without a faint band of spots. Life History: Adults have a low, fast flight. Mating occurs on the first day of emergence, with males perching on low vegetation to watch for receptive females. Eggs are laid singly on broad-leaved plants, and the caterpillars must climb down into the grasses. Caterpillars eat grass leaves at night and make shelters of silken tubes lined with grass. Fourth-stage caterpillars overwinter in shelters that are partially underground. Caterpillar Hosts: Little bluestem (Andropogon scoparius), bluegrass (Poa pratensis), and panic grass (Panicum). Adult Food: Nectar from a variety of flowers including prairie coneflower, purple coneflower, blanket flower, fleabane, black-eyed susans, ox-eye daisy, and harebell. Habitat: Rolling hills of native tall-grass prairie. Range: Southern Manitoba and western North Dakota to western Minnesota, south to northwest Iowa. 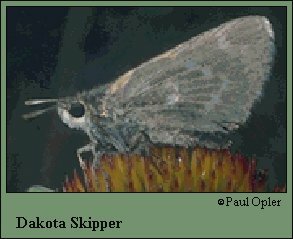 Conservation: Conversion of tall-grass prairie to agricultural use has eliminated most of the habitat of the Dakota Skipper, especially in Iowa. All populations should be protected. Management Needs: Care should be taken not to extirpate populations through the use of fire as a management tool.